Johnson C. Smith University, a historically African American institution associated with the Presbyterian Church, was established in Charlotte in 1867 as a "freedman's school" under the auspices of the Catawba Presbytery. Two white ministers, Samuel C. Alexander, a Pennsylvania native, and Willis L. Miller, a former slaveholder and Confederate soldier, proved instrumental in the school's founding. They were assisted in this endeavor by a gift of $1,400 from Philadelphian Mary Duke Biddle, widow of Union major Henry J. Biddle. The school was situated on eight acres of land in northwest Charlotte donated by former Confederate colonel William R. Myers. From 1867 through 1923, the school was known first as the Henry J. Biddle Memorial Institute and later as Biddle University. In 1891 Daniel Sanders became the first African American to head Biddle University. Born a slave in South Carolina, Sanders had been educated at Western Theological Seminary in Allegheny, Pa., and as a pastor and public school principal in Wilmington had produced the African-American Presbyterian. The university implemented a teacher training curriculum in English, history, language, music, and science in 1912. During the 1920s, after a tragic fire, Biddle received $720,000 from Jane Berry Smith, widow of prominent Pittsburgh pharmacist and industrialist Johnson C. Smith. The Smith family's most lasting monument was the University Church, which was built in 1929 and remains a center for religious activities. In 1923, in response to the family's generosity, the trustees changed the name of the university to Johnson C. Smith University. In 1924 tobacco magnate James Buchanan Duke established the multimillion-dollar Duke Endowment, naming Johnson C. Smith University as the recipient of 4 percent of the endowment's income. In 1925 the university was accredited by the North Carolina Department of Education as a four-year college, and two years later the school's teacher education graduates were certified in every southern state. In 1928 Johnson C. Smith University implemented a two-year premedical curriculum, and the next year the school discontinued its high school curriculum. In 1932 the university witnessed the beginnings of coeducation when, as a result of a reciprocity agreement, Barber-Scotia Junior College, a historically black school for women in Concord, began sending its graduates to Johnson C. Smith to complete their degrees; this arrangement would last until 1941, when Johnson C. Smith began admitting female first-year students. In 1994 Dorothy Cowser Yancy, a Johnson C. Smith alumna with a Ph.D. in political science from Atlanta University, became the first female president of the university. Her tenure was marked by a successful $50 million fund-raising campaign and by joint research ventures with several leading universities. Johnson C. Smith maintains international studies agreements with Al Akhawayn University and Mohammed V University (Morocco), Moscow State Institute of Public Policy, Moscow State University, Oxford University, the University of Cape Coast (Ghana), and the University of Swinburne (Australia). Johnson C. Smith has had a number of notable firsts since its founding. Biddle University was the first southern four-year institution to have a black professor and a black president. An 1892 football contest between Biddle and Livingstone College (Salisbury) was the first black intercollegiate football game. 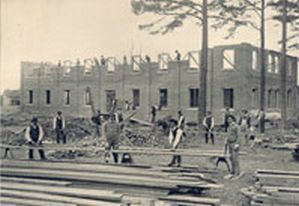 Johnson C. Smith was the first historically black institution in North Carolina to construct a gymnasium (1928); it entered the Colored (now Central) Intercollegiate Athletic Association in that year. The school was also the first black college in North Carolina to obtain accreditation from the Southern Association. The school in the early 2000s enrolled approximately 1,400 students and had 80 faculty members. Arthur A. George, 100 Years, 1867-1967: Salient Facts in the Growth and Development of Johnson C. Smith University (1968). Inez Moore Parker, The Biddle-Johnson C. Smith Story (1975). Biddle Memorial Hall is being built, 1883. Photo courtesy of the Johnson C. Smith University History webpage. Available from http://www.jcsu.edu/about/our_university/history (accessed May 4, 2012). Information is very much educational and historically interested.